the tenfold power density. 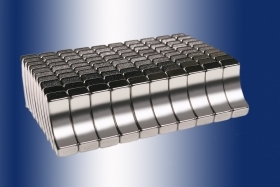 The excellent magnetic characteristics of sintered NdFeB magnets are based on the strong magnetic matrix phase Nd2Fe14B (tetragonal structure), with a very high saturation magnetization Bs (Bs = 1.6 T) and a high magnetic anisotropic field strength Hcj of up to 41 kOe. The current energy product from NdFeB magnet's reaches up to 55 MGOe. This achievement opened a wide field of new application possibilities for the material.